I spent last Saturday visiting Lanyon Homestead for the annual Open Garden Scheme Plant Fair. I knew the day was off to a good start when I ran into a friend just inside the entrance. 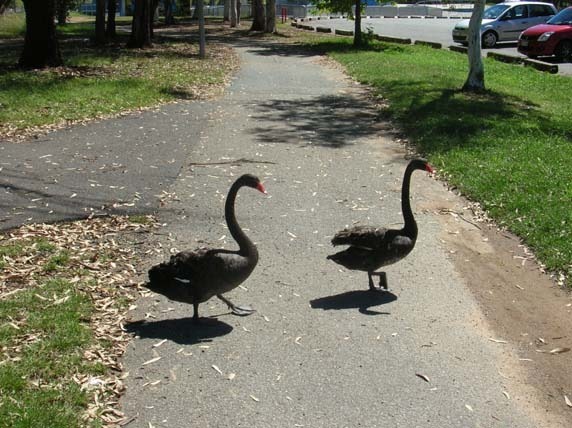 So we set off together for the vegetable garden talk. The picking and vegetable gardens are placed on a set of northern facing terraces, to the north of the house. The terraces were created in the 1930’s by the Field family, using soil they dug up on the river flats to improve the beds. Today more conventional mulching with silage hay and the addition of compost improves the fertility of the soil. Here in the herb garden Alison stands between a large sowing of parsley and chives. Behind her, with the blue flowers, is borage and also oregano. These latter two group of plants were collected from Lanyon’s ‘picking garden’ and transplanted into the herb garden.To reinforce the emphasis on herbs that would have been traditionally grown here, cuttings of rosemary from Mugga Mugga have been included in the garden. This bed also contains thyme, lemon balm, rocket, chilli, sage and bay. 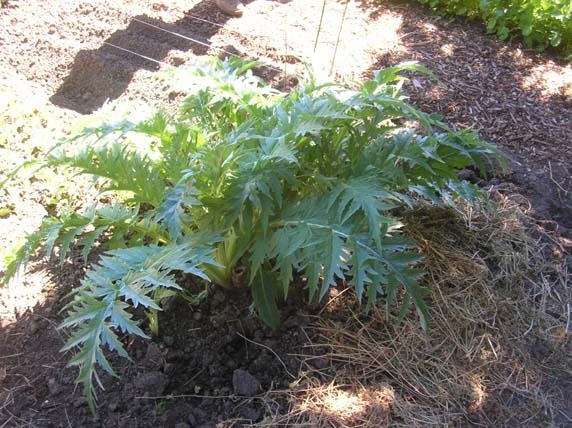 One unusual ‘historic’ plant growing in the garden are cardoons. Grown for their stems, which are blanched prior to eating this plant is actually the natural form of the more widely cultivated globe artichoke, which is also grown at Lanyon. No wonder I was having trouble telling the two apart. Alison has also been growing gourds, another plant which seems to have fallen out of fashion. While many cultures use gourds as a storage vessel Alison did admit that she grows them mainly for their interesting looks. We worked our way down several more terraces looking at beds of pumpkin, Jerusalem Artichokes, tomatoes (suffering like everyone else’s from the wet weather), beans and chard. There were also signs of a good harvest of raspberries and thornless blackberries this year, although we were too late for the Red and Black Currants. 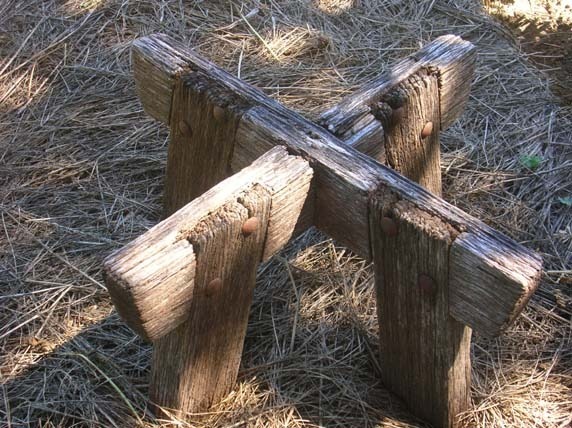 One last mystery remains – what is this? It looks like some sort of stand for a water tank (it’s only about 50 cms high), but no one is sure what it’s purpose was. Thankfully it remains as an object of interest, if nothing else, in the garden. Our guided tour finished we walked around the lovely old apple orchard next to the vegetable patch. other key plantings in this area are medlars, an uncommon fruit nowadays, but traditionally grown in England. More memorably, the medlar’s fruit has the somewhat dubious honour of being known colloquially as ‘dog’s arse’. Moving right along, there are also persimmon’s and pomegranates growing in this area. After all the walking around I decided to try some of the exotic flavoured ice creams on offer. I was one bite into my rose petal icecream when I was temporarily distracted, only to find that my scoop of icecream had slid off onto the ground with a resounding plop. Quelle horrible disappointment! Thankfully the rest of the afternoon was redeemed by cruising the garden stalls. My two best buys of the day were a Kingston Black cider apple plant and a leaf rake with real metal tines! I’m trying to invest in better quality gardening tools these days to replace the poor quality ones generally available. The rake has a handle that extends, or telescopes down to half size for easy storage.You can also vary the width of the rake head allow you to rake in a narrow area. Whatever will they think of next. No doubt I’ll be able to give it a thorough testing when leaf-raking time comes soon. While winter may not be the best time to visit this garden, come spring I’ll be heading out to Lanyon again to see what’s growing. From 1 to 7 April this year Local Harvest is challenging people around Australia to eat more local produce. Like they say it’s one week where you can relaim your food choices and decrease the degree of separation between you and your food. At Chez Fork we will be focussed on eating largely from our own garden, produce from other friends and neighbours gardens and whatever we have foraged lately. We had hoped to have our chooks by now but are still several weeks off getting the pen finished so that will have to wait until next year. 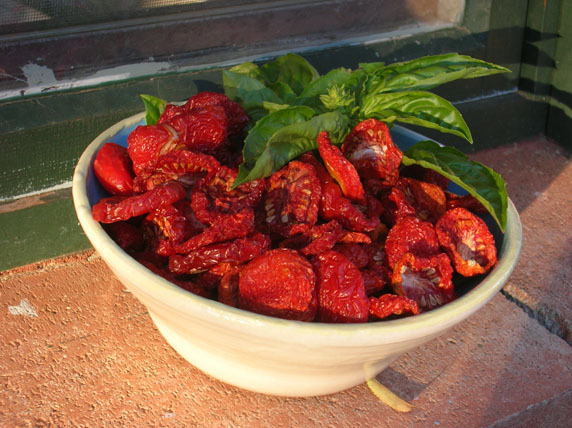 Here’s a potential starter for next week – our ‘sun-dried’ tomatoes (well four days on the shed roof and a bit of help at night with the fan). 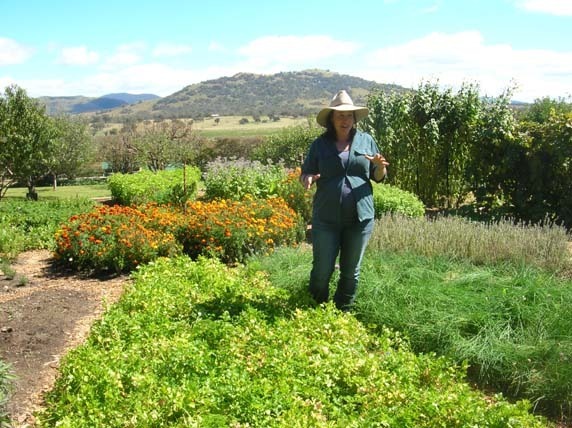 You’d better get organised because this weekend coming 31 March and 1 April will see several garden related events happening in the Canberra region. 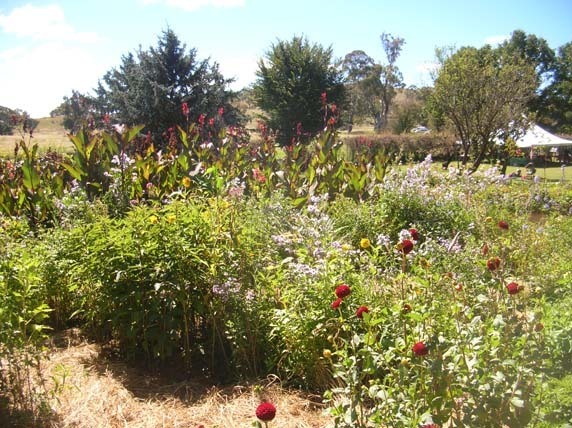 The Australian Native Plants Society in conjunction with the ACT Parks and Conservation service will be encouraging ACT residents to remove environmental weeds and replace them with local Australian native plants. Bring the remains of your woody weeds to the recycling centres (listed above) then visit the Weed Swap stall to get your free replacement plant. The targets include Pyracantha, Privet, Gorse, Cotoneaster, Broom, Hawthorn, Periwinkle and Honeysuckle and grasses such as Serrated Tussock, Chilean Needle Grass and African Lovegrass. Free guided bus tours, food and culture, kite flying, tours of the new Visitors Centre (under construction), Canberra Display Garden. Hooray, back at last the first episode of 2012 screens this Saturday, 31 March, at 6.30pm on ABC 1. New host Costa Georgiadis, takes over from Stephen Ryan, the rest of the team are continuing this year. We tried to make cider last year with limited success, I think the term ‘small scale production’ took on a new meaning with our 1.5 litres of finished product! However this year we are determined to do a bit better. 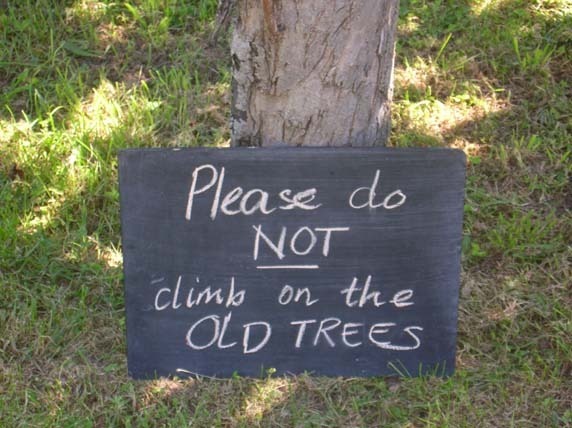 Following our visit to Reidsdale Old Cheese Factory to wassail the apple trees in September last year we knew exactly where to find professional help. 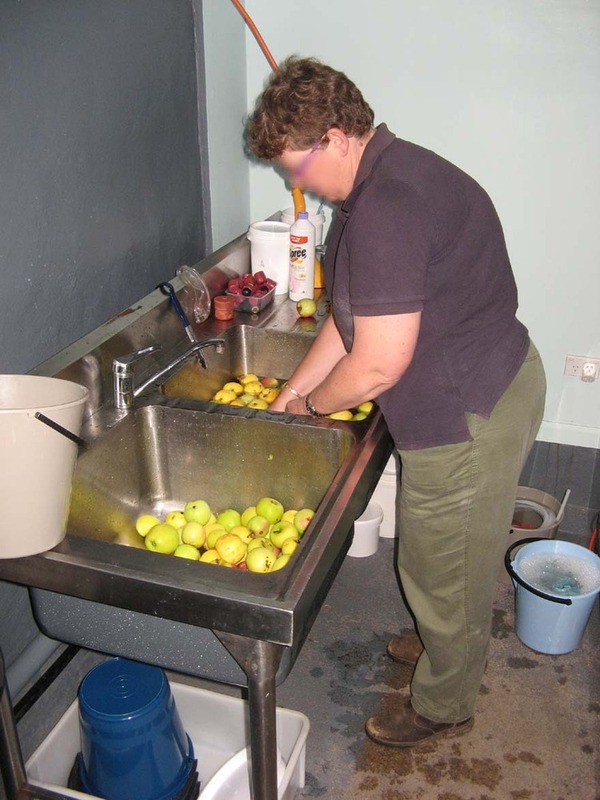 Sully’s Cider House offer an apple pressing service to members of the public. They will also take your juice through the full pasteurisation or cidering process if you choose not to do this yourself. 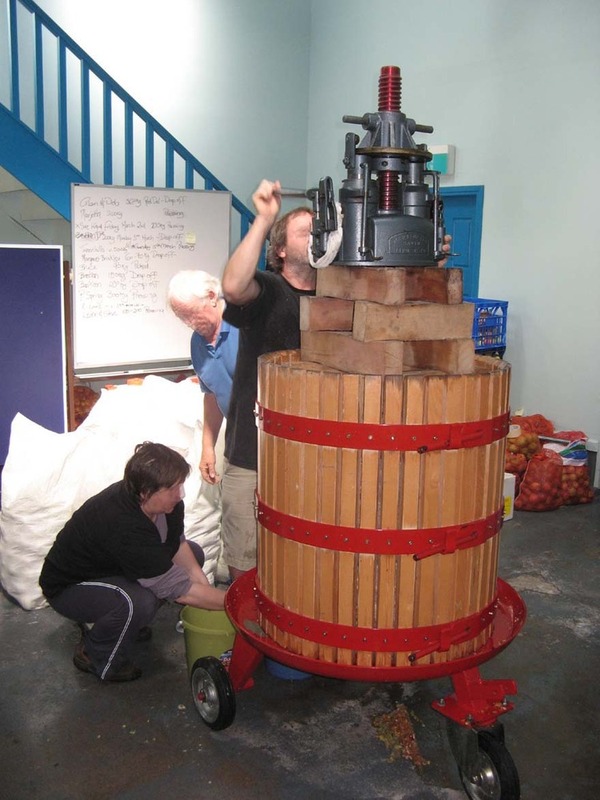 Their press requires some 200kgs of fruit to operate so you do have to have either several large trees of your own or access to trees to get a pressing done. 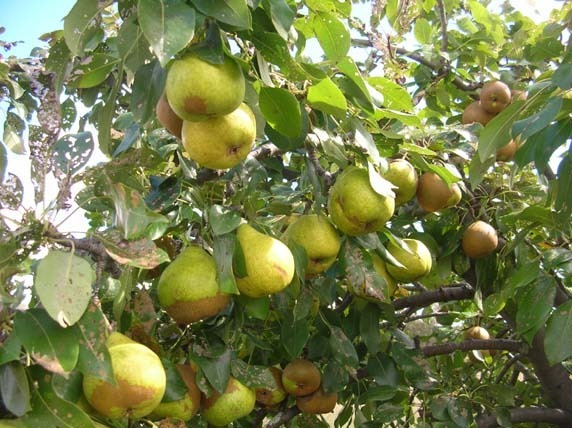 First we needed to get some apples so we hit the roads around the ACT to find feral fruit trees, of which there are many, growing on the roadsides. Feral fruit always makes me think of fairly ratty, spotty, insect infected fruit. Surprisingly that’s not what we found. 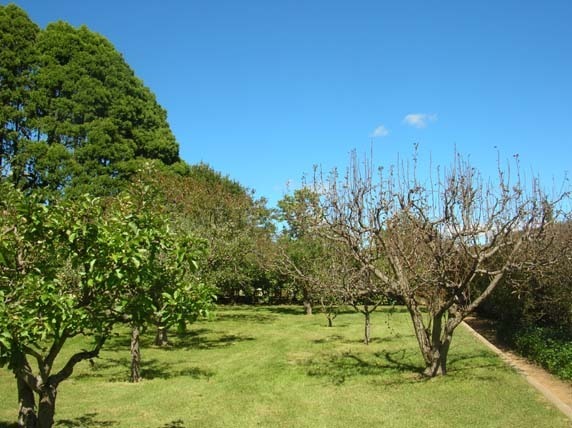 Here are some pictures of two of the apple trees and a pear tree that we collected fruit from. Picture perfect as you can see (well OK the pear had a few ratty leaves). You can quite readily mix apples and pears in the same cider batch. Having lived in a kitchen full of fruit and plenty of small spiders for several days we were quite pleased when the day came to get the fruit processed. 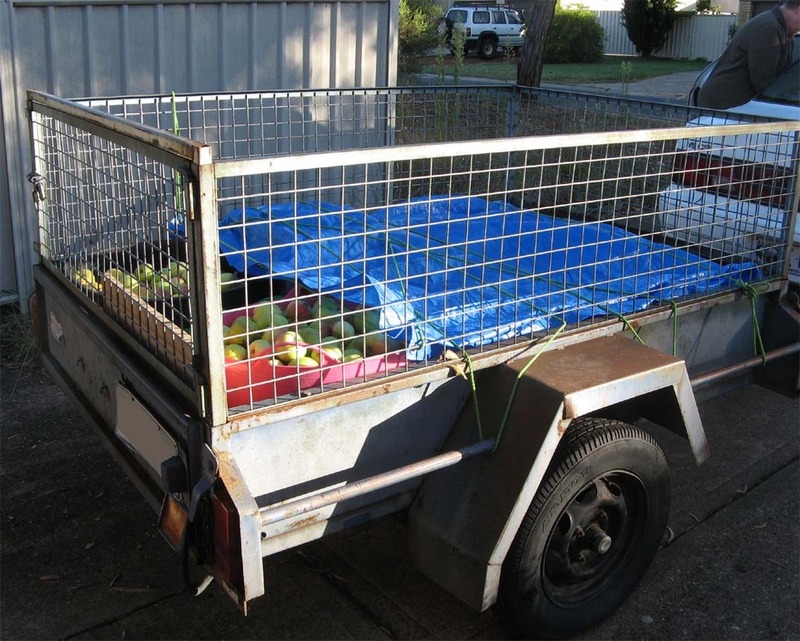 We got underway with our trailer load of fruit (not to mention some more bags in the boot) and headed out to Braidwood. and finally carefully building up the layers of the cidery ‘wedding cake’. Building up layers with some nylon curtain netting in between is critical to ensure that the juice can flow out between the layers and avoid the massive build up of pressure that could result in the fruit exploding out of the press. (Aparently very ugly, not to mention sticky, when it happens). Even before the fruit is pressed the weight of the layers is enough to start the juice flowing. In this barrel is over 20 litres of juice that was collected before any pressure was placed on the fruit. Then on go the sides of the press and the main action begins. 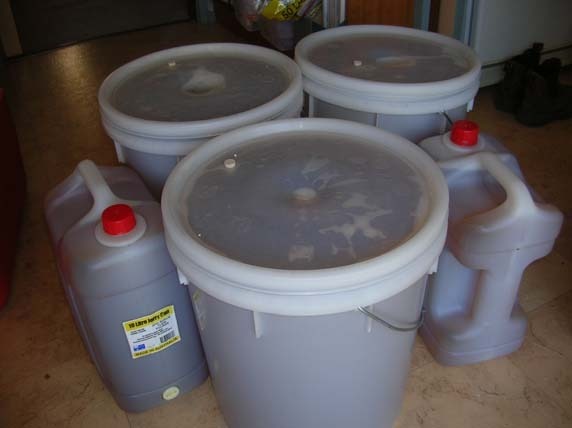 From our near to 250 kgs of fruit we got 115 litres of apple juice. We didn’t bring all of it home – Sully’s will buy back from you any suitable juice that is excess to your requirements. No rest for the wicked as we had to get stuck into bottling and preparing the fruit juice for fermentation as quickly as possible. We have a number of uses for the juice. 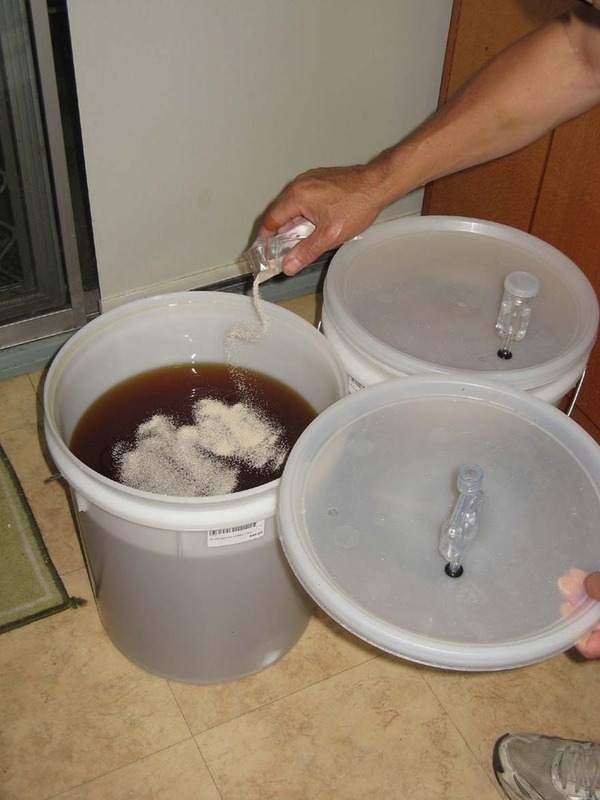 Roughly half is being made into cider, TB is seen here adding champagne yeast to the juice. We decided not to go down the ‘wild’ yeast path for our first large batches as the process can be difficult to control and may well deliver a product with some very unpleasant flavours. Of the rest we have fresh juice to drink this week. We have also saved most of the remaining juice in sterilised bottles, which are then pasteurised in the same way as you bottle fruit, ie heated in a water bath for 30 minutes. These we will be able to keep for later use. The last remaining 10 litres is being devoted to two small projects. Firstly I’m making a demijohn of cider which has had leatherwood honey added to it. The higher sugar levels will raise the alcohol content of the cider. 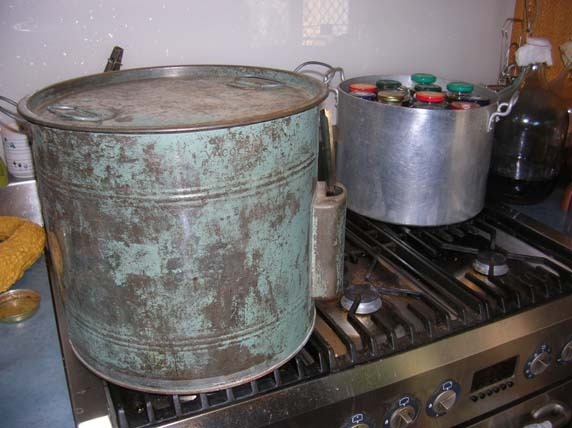 However, we will have to wait and see whether we get any trace of the leatherwood flavour in the final product. TB is turning the rest of the juice into apple version of vino cotto (or what ever you would call it) by very slowly heating the juice at low temperature, over several days, to reduce the juice to a viscous lushness. If nothing else we have a delightful apple scent throughout the house accompanying the slow bloop, bloop of the fermenting cider in the kitchen. 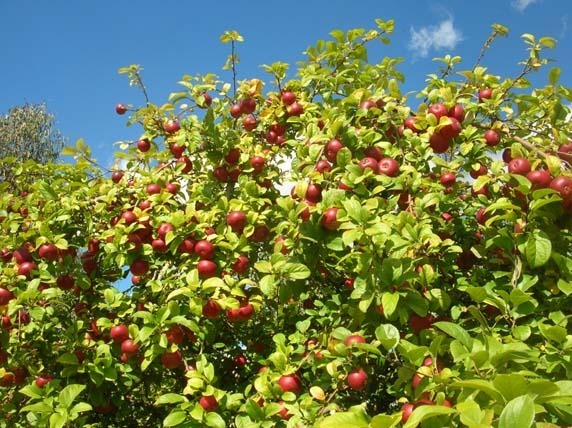 If you are interested in making your own cider you might find the pages of the Whittenham Hill Cider Pages useful. Contrary to earlier advice the Canberra and Queanbeyan Poultry Club pure bred sale will now be held on 13 May (not 15 April as previously advised). Details on the sale can be found here. The open garden scheme season traditionally ends with the annual plant fair, hosted in turn over the past few years, around the ACT at least, in a sucession of beautiful old homesteads such as Lambrigg and Bellevale. This year its Lanyon’s turn. Its been a few years since I’ve taken a turn around their gardens so I’ll be interested to see what’s happening, particularly in the veggie patch. The Lanyon Gardener (no name provided) will be speaking about the veggie patch on the hour from 11.00 am to 2.00pm on both Saturday and Sunday. A full list of speakers can be found here. 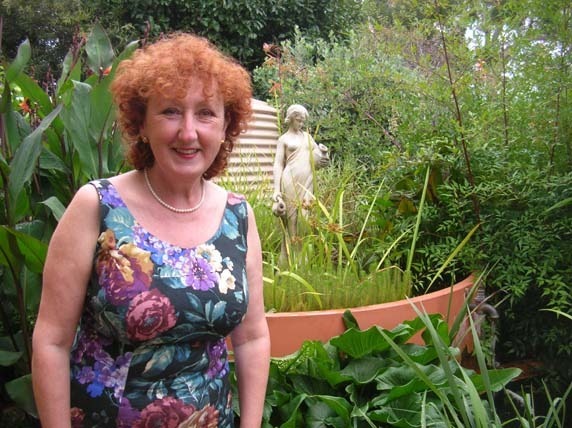 Chef Janet Jeffs will also be speaking, on Saturday only, about organic and biodynamic growing and cooking. And then there are all the stalls to get around! Last Saturday we went to one of this year’s special event’s in the Open Garden Scheme’s calendar of events – Chooks in the City. Author Alyson Hill (who wrote Chooks in the City) was on hand to give us a run down of keeping chooks in your backyard. Alyson’s talk was hosted by the charming Theresa who, along with her girls, Candy, Sandy and Mandy, opened her lovely Red Hill garden for the event. Sorry I can’t tell which girl this one is. Alyson spoke about which chicken breeds were best suited to back yards, chook health issues, how to deal with broody hens and how to incubate eggs amongst very many other topics. All grist to our particular mill as the building of our own chook house is an extremely ongoing project. Alsyon’s passion for chooks runs deep and she was extremely generous with her knowledge. The audience asked quite a broad range of questions so we ended having a very free-ranging discussion (OK couldn’t resist that one). Thankfully the rain which had made its presence felt earlier in the day cleared to enable us to enjoy Alyson’s talk in comfort. We also had enough time to have a good look around Theresa’s garden before and after the talk. I particularly liked the path down the garden to the chook shed. Theresa has made her garden very easy to access with a series of square garden beds surrounded by paving. She’s currently in the process of finishing up summer plantings and growing new plants for the coming winter months. There were plenty of fruit trees in the garden including several fig trees carrying quite a crop. I also really liked Theresa’s style of grouping container plants such as this collection of succulents. The morning concluded with a fantastic spread of food provided by Theresa and her friends (as well as ‘the girls’) who contributed their eggs for some particularly tasty egg sandwiches. Another great open garden event. The Canberra Queanbeyan Poultry Club is planning to conduct a Pure Breed Poultry Sale at the Queanbeyan Showground on Sunday 13 May. Royal Canberra National Poultry Show at EPIC 8-10 June. Last weeks big wet did more than raise the water levels in the Murrumbidgee River and cause flooding downstream. In Namadgi National park there were several large landslips, including this one on Mt Tennant. That vertical streak down the face of the mountain was formed by a big landslide sometime on Thursday evening. It’s hard to get the scale of the slip until you know that the boulder (circled in the photo below) is about the size of a decent sized loungeroom. It seems quite a long time (well just over a week really), when I started working on preparing the backgarden for autumn planting. I confronted the bed where the ‘changeling’ squash was expanding exponentially and decided that I’d had enough of this not-a-zucchini so it was getting ripped out. We actually have no idea what this plant actually is – we thought we had planted more ‘Wrinkled from Friuli’ (Zuchetta rugosa friulana) in this bed but the fruit that I displayed in my post on this topic, was definitely not what I thought I’d planted. It gave me a really good feeling to rip out these plants, plus they were mouldy and in the way. Underneath I found all sorts of things. There was a self-sown tomato (with ripe fruit even!) and several beetroot plants. I decided that I’d put a late crop of beans in, on the assumption that I might still get a result out of them, or at the worst I could dig the plants in as green manure if the frosts came early. the beans seem quite happy and are growing away well. I think it will be the corn bed next. At least we got all the cobs off before the rain started. 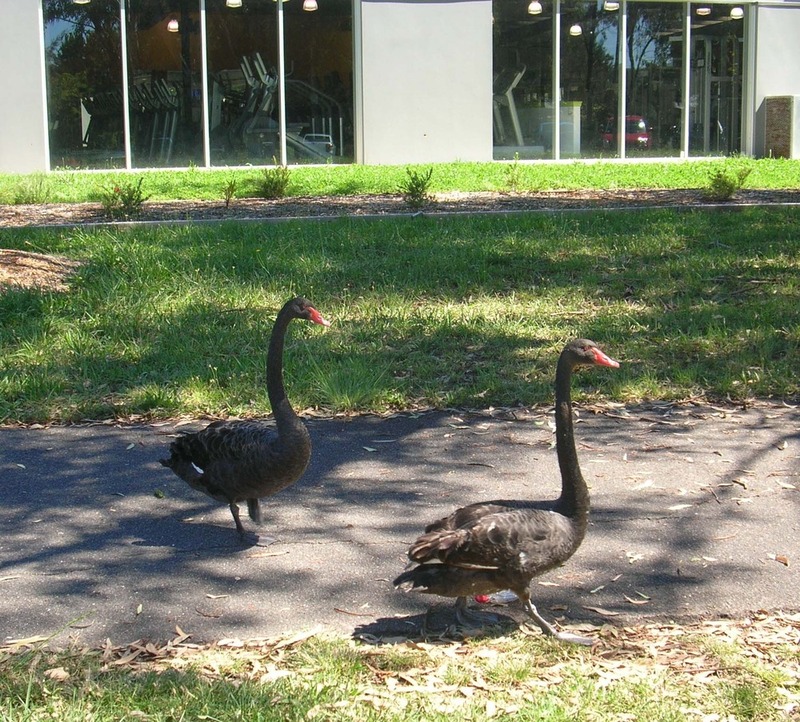 Checking out the gym facilities it seems.